GREG HAS PASSED AWAY BUT HIS LEGACY LIVES ON. THE ROAD THAT GREG AND DEB PLOETZ TRAVELED SINCE GREG WAS DIAGNOSED WITH MIXED DEMENTIA IN 2009 IS A REFLECTION OF THE STRUGGLES THAT MANY OF OUR TEAMMATES AND THEIR FAMILIES HAVE EXPERIENCED WITH THIS DREADED DISEASE. AFTER BEING DIAGNOSED WITH DEMENTIA, GREG DECIDED TO PAINT A TRIBUTE TO HIS TEAMMATES. THE COMPLETION OF THIS PAINTING IS A STORY OF HIS HEART HOLDING ON WHILE HIS MENTAL CAPABILITIES AND HAND-EYE COORDINATION DETERIORATED. THIS PAINTING WAS COMPLETED IN 2010, AND IT IS OBVIOUS THAT HE WAS STRUGGLING WITH DETAILS. HOWEVER, HIS EFFORTS WERE NOT ABOUT ART; THEY WERE ABOUT THE HUMAN SPIRIT WINNING BATTLES AGAINST THIS AGGRESSIVE DISEASE. THIS PAINTING IS A SPECIAL AND PERSONAL GIFT FROM GREG PLOETZ TO HIS TEAMMATES--A VICTORY OF THE HEART OVER THE MIND. GREG'S HEART WAS MY INSPIRATION TO TACKLE A PROJECT THAT WAS TOUGH TO COMPLETE. 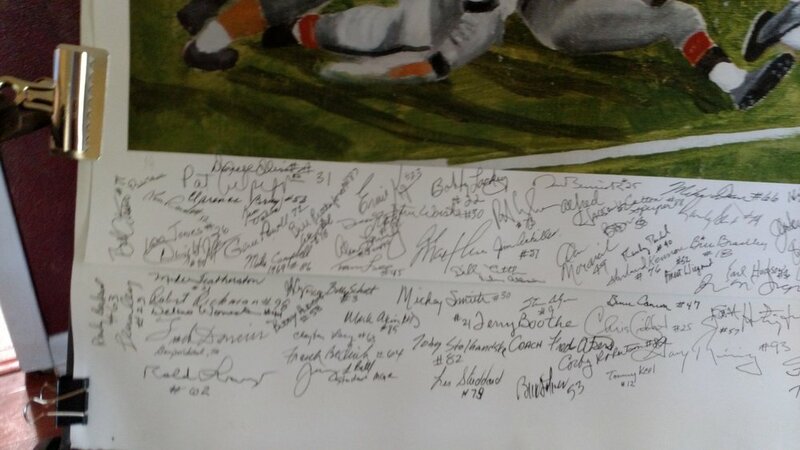 THE GOAL WAS TO HAVE 500 FORMER DKR PLAYERS SIGN GREG'S PAINTING . AS OF 1/21/2018 THERE ARE 280 SIGNATURES HAVE BEEN ADDED TO THE PAINTING. IF THE FINAL GOAL IS ACCOMPLISHED, IT WILL BE THE ONLY AUTOGRAPH RELATED ITEM WITH THIS MANY SIGNATURES OF DKR PLAYERS IN EXISTENCE. THESE PLAYER DELIVERED 3 NATIONAL CHAMPIONSHIPS AND 11 SOUTHWEST CONFERENCE CHAMPIONSHIPS. THE LITHOGRAPH WILL BE AUCTIONED IN 2019 WITH ALL PROCEEDS DISTRIBUTED TO QUALIFYING LONGHORNS IN NEED OF FINANCIAL SUPPORT THRU THE TLSN TAX EXEMPT . MAY GOD BLESS GREG, HIS FAMILY AND ALL OF OUR TEAMMATES AND THEIR FAMILIES WHO HAVE SUFFERED THROUGH TO THE END WITH THIS HORRENDOUS DISEASE. 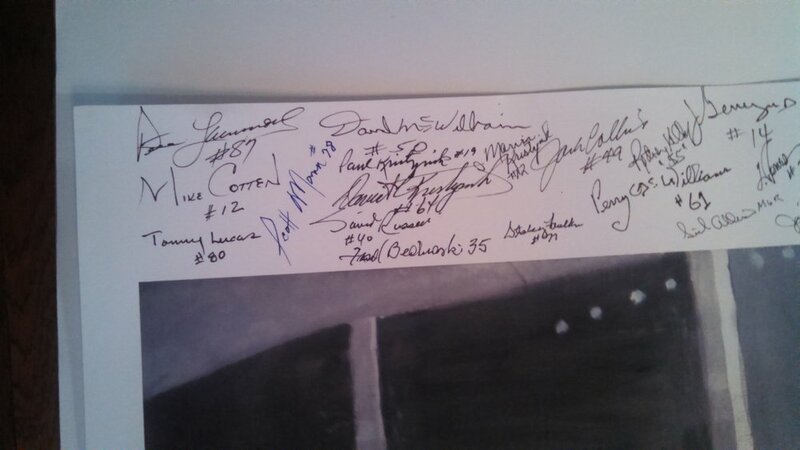 The individuals listed below in alphabetical order by first name have signed Greg's lithograph.